For forty minutes last night, Michigan looked like the team we expected to see this year. It was against an Ohio State team without their best player, but it was an impressive effort from top to bottom. The great performance came on the backs of an inspired effort from Manny Harris and DeShawn Sims, who combined for 52 of Michigan’s 73 points on combined 65% shooting (22/34). In what was one of their most dominant performances since last year’s Purdue game, Harris and Sims simply couldn’t be stopped as they scored the ball from inside and outside. While Harris and Sims were phenomenal, it was a freshman who gave Michigan their biggest spark of the second half. Backing up Manny Harris in a “get me over” type of shift, Matt Vogrich inspired Michigan with a number of hustle plays in only two minutes. In his second half shift, Vogrich pulled down two offensive rebounds, one for a put back score and then managed to tie up David Lighty for a jump ball. Vogrich has struggled this year, and even his first half shift he was abused on the defensive end leading to two wide open Jon Diebler three point attempts which making it all the more shocking when he took over the game, even for a short moment. Michigan’s defensive effort in the second half was tremendous from top to bottom. They held the Buckeyes to an eFG% of only 35% in the second half after letting them get loose in the first with an 59.5 eFG%. After allowing Jon Diebler to score 14 points in the first 12 minutes of play, Michigan managed to limit him to only 17 for the game. Despite struggling on the defensive glass (Ohio State rebounded 42% of their misses), this was Michigan’s most inspired defensive effort to date. Lighty (13 points on 12 shots), Buford (16 points on 17 shots), Diebler (17 points on 14 shots) put up solid point totals but they certainly earned them, taking a number of shots to get there. Offensively the numbers look good as well. Michigan shot the ball very well (eFG% of 61.5%), won the turnover battle, and got to the line a bit more (mostly thanks to late game OSU fouling). Michigan shot only 30% of their field goal attempts from three point range as they relentlessly pounded the ball inside to DeShawn Sims and Manny Harris. Michigan obviously needs to build off of this momentum. It would take a dramatic turn around to truly save this season. The obvious question is whether this is a sign of a turnaround or just a flash in the pan of what could have been. However, playing with the effort and energy that we saw on Sunday afternoon should be a given from here on out. Michigan heads to Penn State (8-6, 0-2) on Thursday to take on Talor Battle and the Nittany Lions. Manny Harris: It would have been fun to see him go head to head with Evan Turner but he was simply dominant: 24 points on 9-16 (3-6 3pt) shooting, 7 rebounds, 5 assists, 3 steals, 1 block, and 4 turnovers. Ohio State was daring Harris to go left the entire game, and once he finally did a couple times it really opened his offensive game. It seemed like everything he threw up went in whether it was an off balance three point shot or a running layup in the lane after getting tackled by David Lighty. DeShawn Sims: Sims was actually better than Harris today and he had his motor running for the entire game: 28 points (13-18), 9 rebounds, 1 steal. Michigan can beat anyone when Sims plays like he did today but he needs to find consistency. Michigan looked to Sims inside early and often and he rewarded them time and again. Zack Novak: Novak’s shot wasn’t falling today (1-5, 1-3 3pt) but he still managed 2 assists and 2 steals and I thought he played great defense on David Lighty for most of the game. 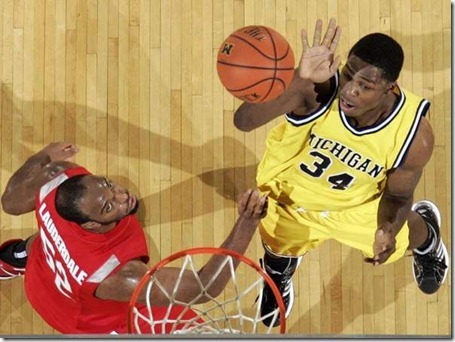 It was also a blessing for Novak that similar to Michigan, Ohio State plays a four guard lineup. Stu Douglass: Stu Douglass is becoming the leader in the backcourt: 9 points (2-6), 4 rebounds, 2 assists, 0 turnovers. It is obvious that he has the best understanding of the offense and probably the defense as well. After playing 40 minutes in Bloomington, Douglass notched 39 minutes last night, let’s hope he is in shape because it seems like he will be playing a lot of minutes in conference play. Darius Morris: Slowly but surely we see more and more of Darius’ potential. He received the majority of the guard minutes in the second half and scored 5 points in the second half. It’s clear that he is getting more comfortable on both sides of the ball. Laval Lucas-Perry: For the second game in a row, Laval was held scoreless and saw Darius Morris take most his minutes as the game went on. 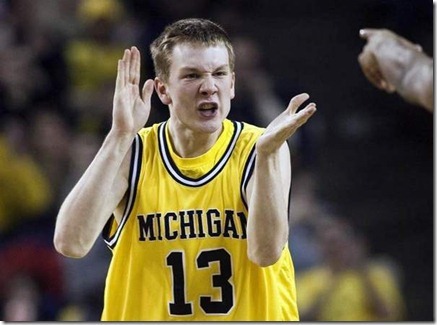 He’s just not providing Michigan with much of a boost although he did notch 3 assists to 2 turnovers. Zack Gibson: Gibson didn’t see much playing time because DeShawn Sims was too dominant to keep off the floor but I’m certainly alright with that. Matt Vogrich: As mentioned above, Vogrich gave Michigan a huge lift in the second half. His first half shift he got abused by Jon Diebler and it was clear that he wanted to make up for it which he certainly did. Anthony Wright: Anthony Wright is killing this team. He is a huge drop off on both sides of the ball, especially defensively, from Zack Novak. To his credit he managed to play his best in the last 5 minutes when Novak was sent to the bench with four fouls.